Trump Administration Unveils Sanctions To Curb North Korea's Weapons Program : The Two-Way Ten Chinese and Russian companies and six individuals are targeted. Many were tied to the rogue country's coal and resource trade and its efforts to send workers abroad. Ten Chinese and Russian companies as well as six individuals are targeted by a new round of U.S. sanctions aimed at curbing Pyongyang's weapons program. This follows a round of U.N. sanctions. The Trump administration has unveiled new sanctions against Chinese and Russian entities as part of an escalation to curb North Korea's nuclear and missile programs. In a statement released Tuesday, the Treasury Department said the goal of this latest round of sanctions is to stem the flow of money going toward Pyongyang's weapons program by tightening the sanctions. "Treasury will continue to increase pressure on North Korea by targeting those who support the advancement of nuclear and ballistic missile programs, and isolating them from the American financial system," Treasury Secretary Steven Mnuchin said in the announcement. Ten Chinese and Russian companies as well as six individuals were named, some of whom are trading coal, oil and mineral resources with North Korea. The Treasury Department says North Korea generates about a billion dollars a year from coal exports and singled out three Chinese companies, which it says imported almost half a billion dollars in North Korean coal between 2013 and 2016. Will Tough New U.N. Sanctions Work Against North Korean Regime? Kent Boydston, a research analyst with the Peterson Institute for International Economics, said the sanctions send a signal. "It's a message to firms throughout the world that the U.S. is going to target these entities and you cannot hide behind the cover of being in China or Russia," Boydston told NPR in an interview. The sanctions also hit those who help individuals previously penalized for involvement in North Korea's weapons program and assist the country in sending workers abroad. Other targets include those helping North Korean entities gain access to U.S. and international financial systems. "It's really forcing firms to decide are you going to deal with these shady North Korea financial institutions or firms or do you care more about having access to the U.S. market," said Boydston. 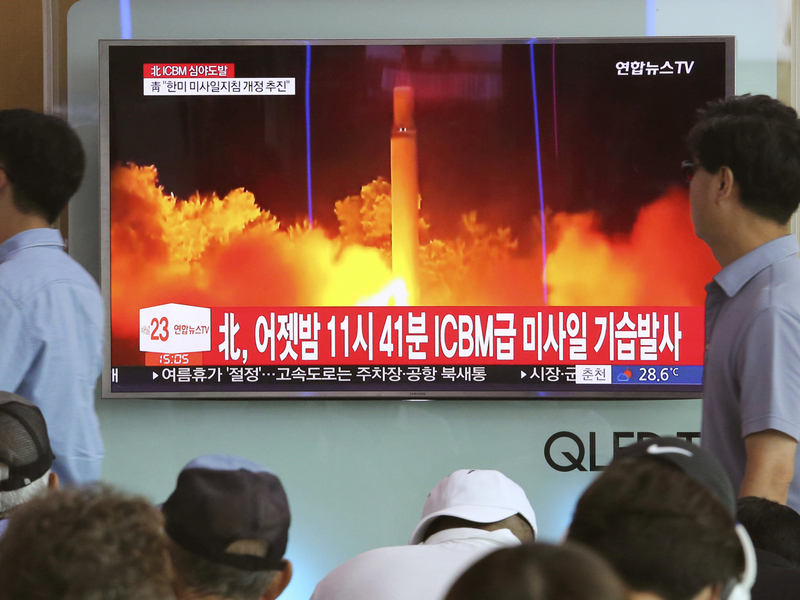 The move comes amid increased tension between Washington and Pyongyang, which has defied United Nations resolutions and conducted numerous missile and nuclear tests. The Treasury Department says the new round of sanctions complements those passed by the United Nations Security Council earlier this month. Treasury Secretary Mnuchin also noted the U.S. is "taking actions consistent with U.N. sanctions to show that there are consequences for defying sanctions and providing support to North Korea, and to deter this activity in the future." Anthony Ruggiero, a senior fellow with the Foundation for Defense of Democracies, thinks the sanctions are a significant step forward — and part of a strategy by the Trump administration to clamp down on those who continue to work with North Korea. Ruggiero adds that the move won't be lost on China's leadership. "No Chinese banks were targeted, but that's the next level. And if the Trump administration is continuing this robust sanctions campaign, then the next level is going to be some kind of action against a Chinese bank, which I think the leadership in Beijing wants to avoid," Ruggiero told NPR.